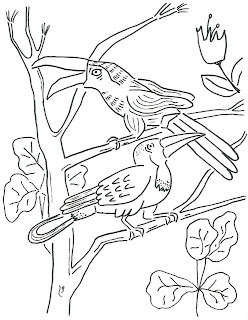 This was my drawing the day Norah and I followed Drawing With Children's instructions for creating a montage of tropical birds. I turned it into a coloring sheet for Norah and decided to share with you, too. Double click on the black and white image above to make it large. Save image as... to your desktop to have a printable version saved to your computer.